Process and plant engineers contending with swirl and other flow disturbances in the line will find the new FPI-X™ Dual Sensor Electromagnetic Flow Meter from McCrometer delivers accurate and repeatable measurement under extreme flow conditions unachievable with other technologies. 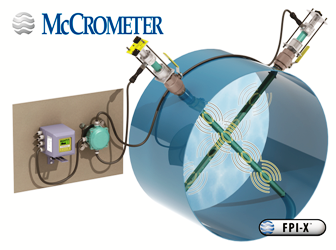 The McCrometer FPI-X flow meter reliably achieves ±0.5% accuracy under the most severe swirling flows. Designed for use in close proximity to cascading or multiple pump arrays, this meter delivers the advantage of accurate measurement where no flow meter previously could serve. Whether installed near pumps, valves, elbows, headers, or any other equipment that makes it impossible to create a symmetrical velocity flow profile in the pipe, the FPI-X will outperform traditional mag meters. The FPI-X mag meter provides measurement in difficult sites that otherwise require multiple meters in various locations, saving customers both money and installation time. The FPI-X also eliminates the expensive flow conditioners and piping modifications necessary with other meters. FPI-X is the latest product line extension from McCrometer, and is based on its patented and award winning FPI Mag meter technology. The FPI-X flow meter features a field-proven dual sensor configuration designed with multiple electromagnetic coils installed throughout both sensors to produce a magnetic field across the complete cross sectional area of the pipe. Placing voltage sensors in two planes across the pipe compensates for differences in velocity caused by severe flow disturbances. More velocity sensors results in a more accurate measurement. Multi-point sensing technology makes this mag meter ideal in cramped, retrofit and new construction pumping stations or in any constrained space areas with limited straight pipe run availability. The sensor’s body is hermetically sealed and protected by NSF certified 3M fusion-bonded epoxy coating. With no moving parts, the FPI-X requires little to no maintenance for years of worry free operation.